Chris Anderson, the creator of the Long Tail concept (The Long Tail: How Endless Choice is Creating Unlimited Demand: How Endless Choice Is Creating Unlimited Demand ), is now focusing on another interesting topic, the economy of free. His new book will be out next year, Free: The Economics of Abundance and Why Zero Pricing is Changing the Face of Business . However, you can read about Free on an article he wrote in Wired magazine, Free! Why $0.00 Is the Future of Business. The latest news and discussions on this argument can be found on Chris´s Blog on the posts tagged with the free keyword. Why quality scores are used in search engine ad auctions? Lawrence Lessig‘s new book, Remix: Making Art and Commerce Thrive in the Hybrid Economy is soon out. that a new form of business (what I call the “hybrid”) will flourish as we better enable this remix creativity. A stock option, according to investopedia, is a privilege sold by one party to another, that gives the buyer the right, but not the obligation, to buy (call) or sell (put) a stock at an agreed-upon price within a certain period or on a specific date. Stock options are used by many companies as a retention tool and is a way to align the interests of the shareholders with the interests of the managers. In practice, a stock option with an exercise price of 300$ in three years gives the option to the owner to cash in, if in 3 years the market price of the stock is higher than the exercise price (American options can be exercised anytime between the date of purchase and the expiration date. European options may only be redeemed at the expiration date). For example, if in 3 years the stock market price is 400$, the owner can use the option to buy shares at 300$ (the exercise price) and sell them back at 400$ (market price). With an immediate gain of 100$. What happens when the company shares fall below the exercise price? The stock options have no value and do not serve, among other things, as a retention tool. 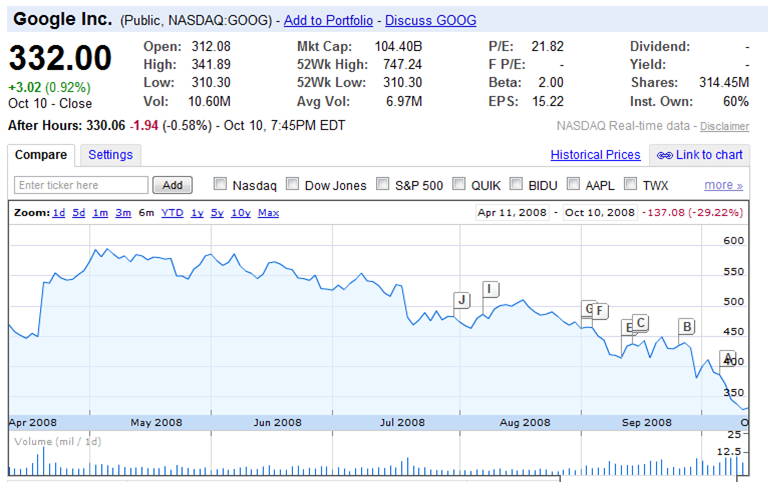 TechCrunch, has a nice article on Google, Google Employees Watch In Horror As 60 Percent Of Their Stock Options Drown. In the last 6 months, the stock went from around 600$ to 300$. According to TechCrunch, Google grants stock options to employees during the week they are hired. The last time the stock was this low was almost exactly three years ago. So anyone hired since October, 2005 is pretty much under water. That is 75 percent of all current employees (Google had 5,000 employees three years ago, and now has about 20,000). However, as remarked in the article, if the economy truly is spiraling into a recession and capital is drying up for new startups, frustrated employees might not have anywhere else to go. And Google is facing the same difficulties the other companies are having. At the Apple Music Event in 2001, Steve Jobs introduces the first ever iPod. He is not launching “yet another music device”, he redefines the music industry with the concept of music experience. A lesson in strategy and marketing, the rest is history. Even though we are more and more interconnected and the world is considered flat (The World is Flat: The Globalized World in the Twenty-first Century ) there are important cultural differences we should take into account when working or living with people from different cultures and nationalities. Oshiya, or “pusher”, is an informal Japanese term for a worker who stands on the platform of a railway station during the morning and evening rush hours, and pushes people onto the train. This video was taken in 1991 on the Seibu-Ikebukuro Line in Tokyo in the morning rush. .
Several industries are converging and we will see interesting battles in the future.